I wince when I think of the money I’ve wasted on bad gear as I was learning to dive. Maybe it’s my propensity for shiny new toys, but I’d rather blame it on a communications gap between the “technical” and recreational dive worlds. Every year dive gear manufacturers come out with new features for their regulators, wetsuits, and BCs. There’s a good business reason for this: manufacturers need to differentiate their product and get consumers to buy more each year. It’s hard to build a business around a commoditized simple item. I suspect golf is like this too. The irony is that diving is one of the few gear-intensive sports where the best stuff is the simplest and often cheapest. By the time you get to technical diving you know this, but meanwhile you’ve wasted a fortune on recreational junk which you could have avoided had there been a nearby technical diver to ask. So here is the first of my “I wish I’d known that” gear posts. I recommend two things to consider when choosing fins. One is obvious, the other maybe not. Fins Shape – Split or Paddle? Oh, I wish someone had pointed this out to me before I’d started buying gear. What split fins do well: high-rpm flutter kicking. When you flutter kick, each “leaf” twists creating a propeller-like effect. This makes it quite good for fast flutter kicks and straight-line speed tests. Sounds great, right? However, here’s the kicker (sorry, couldn’t resist!) — you are not high-rpm flutter kicking when scuba diving! First of all, you shouldn’t be swimming hard to begin with — if you are working hard, something is wrong. Working hard will chew through your gas if you’re on open circuit or put you at risk of carbon dioxide buildup if you’re on a rebreather. If I could drift or get pulled (scooter!) the entire dive that would be just perfect. Second, the kick of choice for advanced diving is not a flutter kick. Flutter kicks push water downwards to cause billows of visibility-killing silt or disturb reef life. If you flutter kicked through a wreck you would likely piss off or endanger nearby divers with clouds of silt. What split fins lack: the stiffness and body you need for frog-kicking, turning and backing up. Frog kicking – this is the kick used by technical divers because it pushes water behind you where it won’t stir up silt. The short, sideways motion of a frog kick does nothing if you have a fin designed to be moved vertically. Turning – you pivot your body underwater by moving your fins in small vertical circles. Doing this with a split fin makes the “leaves” of the fin flutter and inhibit the sideways foot motion, accomplishing almost nothing. Backing up is even worse…you are trying to pull water towards yourself but your “scoop” is functioning like a fork instead of a spoon. OK, maybe a spork. You might as well be barefoot. The Grey ScubaPro splits are close to neutral…. I was incredibly lucky to have people in person (including Twain himself) set me straight on paddle fins before I wasted money. I was also very lucky to get my dad's 30-year-old Aqua Lung Rocket Fins for free. I'm sure there are many lurkers out there looking forward to your obviously forthcoming "I wish I'd known" article on BCs. Write it quickly before they buy what their LDS tells them to buy! I do a lot of shore diving where we do 500 meter or so swims to and from our descent points, and then dive in relatively light current with some surge and no overhead obstructions. I use a bent-knee flutter kick if I'm close to the silt and wouldn't trade my splits (apollos) for jet fins for anything, for these specific diving conditions. I think that using a one size fits all criterion developed by (a) crotchety old dudes that also don't believe in nitrox and computers or (b) DIR enthusiasts whose methodology is careful and soundly motivated if you're diving caves or deep wrecks, does not find the optimal solution for all divers. To be fair the splits cost a pretty penny and I tell students routinely to buy a $40 pair of paddles first and borrow someone's fancy schmancy fins later to see if they feel they're worth the premium for how they use them. I think you bring up some good points, but it is important to remember that not all things best for tech diving are best for recreational diving. As a rec inst. and avid tech diver, I use both sets of fins, and can say that is has saved my life. I use full foot split fins for reef dives. I am diving walls in a drift, and the splits are easier to kick (I do a slow gliding kick). I use paddle fins for tech dives. A few months ago I was doing exploratory diving and the local on the boat fell asleep, I got caught in a rip and swam for 5 hours to another island. I would not have been able to swim for five hours straight in my jet fins. I got on the island broke into a house and borrowed the radio (the owner was compensated 🙂 ). So just remember when you change your dive location or objective, changing some gear might help. Wow Luke, that’s a scary story. Glad you are ok. I would have throttled that “local on the boat”. 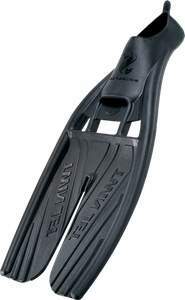 Split fins are a great option for anyone with knee or ankle issues (so they are great to keep in mind as an option). Split fins helped me transition back into the water after knee surgery as they didn’t put as much strain on my knee as my other fins. I still use them occasionally if I’m dealing with any knee pain. However when I’m guiding guests, working with students, or diving in what I know are tough conditions I dive more traditional, stiffer blades as I prefer something that allow me to easily change directions quickly and accelerate without folding. They have an entanglement risk and require faster leg motion which leads to oxygen use and CO2 buildup. Read Revision 7 of US Navy Dive Manual for the best advice possible in the industry that is not linked to selling product. Copyright 2008 Erik Dasque and Sam Clemens :: powered by Wordpress and the The Unstandard theme. :: | | 50 queries. 0.444 seconds.